Finding magic kits for 10 year olds is a difficult job! This isn’t because there isn’t enough choice, it’s actually the opposite. There’s WAY too much choice! Amazon alone has over pages and pages of different magic ideas, gifts and all kinds of fun stuff for kids, and the problem is, they all look the same! How are you meant to know which is the best when there’s so much choice? Today I will be focusing on THREE of these magic kits for kids aged 10+, and explaining what you should be considering before you buy them. In my (biased) opinion, magic is one of the best hobbies to get your child going with at a young age for a few reasons. Firstly, it can be a real confidence booster for otherwise shy kids. I know when I started doing magic I wasn’t a big fan of getting out there and interacting with other kids, but eventually I got bored with just doing magic for the mirror so I had no other choice to. I quickly realized that magic is a great way to socialize and break the ice. Who doesn’t love magic? Secondly, it can really help a child with their communication skills. 9/10 magic tricks are going to require the magician to talk to his audience; ask them things, tell jokes, and just generally interact well with them. The more magic you do, the better you get at communicating well with your audience. And guess what? That skillset transfers over into your day-to-day life too! Finally, it’s just so much fun! Magic is a great hobby because not only is it awesome to watch, it is really fun to learn and perform. It’s a win-win! There’s nothing like the feeling of completely fooling someone and taking their breath away, and it’s a feeling that any child can get with just a little practice and the help of one of the following magic sets. 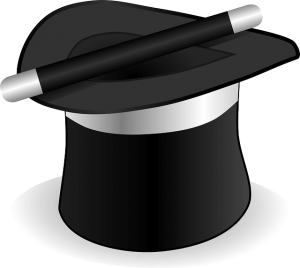 So if your child is wondering how to learn magic tricks, don’t hesitate, go for it! Penn and Teller are two of the most recognizable faces in magic, and for good reason. These two guys have been entertaining audiences around the world for over 40 years! What better way to learn magic than with their official magic kit? 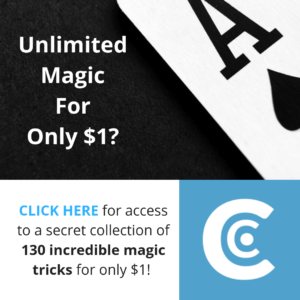 This set comes teaches over 200 classic magic tricks that are tried and tested favorites (handpicked by Penn and Teller themselves). All of the tricks are easy to do, but you’ll be surprised at just how fooling some of them can be! Here’s a picture of all the props you’ll be getting. As you can see, you’ll get your hands on a ‘paper-into-money’ machine, sponge balls, the cups and balls, a magic wand, and much more. Of course, there is a whole book provided that explains exactly how to use these. You’ll also receive a DVD that you can check if you’re having trouble with any of the written explanation. This DVD does feature Penn and Teller too. You also get an instructional booklet with 125 card tricks you can learn using an ordinary deck of cards, which is a nice bonus. The Penn and Teller site reckons the age range for this trick is around 8+, and I’d agree with them there. Although some individual tricks could prove difficult for 8 year olds, the majority can be figured out and done with very little complication. Of course, don’t be put off just because this kit is aimed at children! 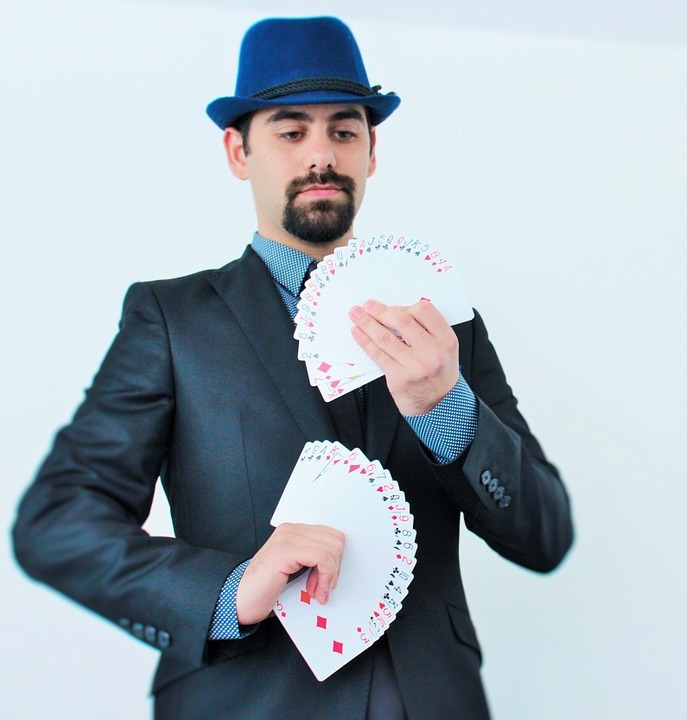 Some of these tricks use similar techniques to professional magicians, just in a simpler format. You can definitely fool adults with these tricks too! Penn and Teller…what else do I need to say? Good reviews on Amazon- 4.3 stars out of 5. Would I recommend this magic set? Although it is placed number three on this list, it is still a safe bet and comes with some awesome tricks that can be enjoyed by anyone, regardless of age. Plus, if your child is already a Penn and Teller fan, that’s a great added bonus. The only issue with this kit is that it’s so popular it keeps going in and out of stock. If it’s in stock right now and you’re considering buying it, just bear in mind that if you aren’t careful it may get all bought up! Read my full review of this kit here. While this kit might not have the faces of two famous magicians printed onto the box, I actually think it is a better investment (although only marginally; there really isn’t much between them). With this kit, you get just a bit more bang for your buck. What I mean by this is you get more actual props included. But the Penn and Teller kit TEACHES you 200 tricks! That’s more than 28, surely? Well, while it may be true that you can LEARN 200 tricks using the Penn and Teller kit, you actually only get around a dozen physical props to do them with. I know that when I was a kid, I didn’t really care about the sets that gave me 4 props but promised to show me how to do 200 tricks from them; to me as a child that was still only 4 tricks. In contrast, magic sets like the Jumbo Magic Kit would have been an awesome gift with around 30 physical props to do the magic with and a simple step by step instructional DVD too. You also get an instructional DVD to walk you through any issues you might be having. The tricks are aimed at younger audiences than the Penn and Teller kit in my opinion. If you’re looking for some tricks that will fool adults and kids alike, you’d be better of with the more limited (but more fooling) range of tricks available from the previous kit. Or check out the No.1 pick for some seriously impressive magic. But if you’re buying for a younger child and the main aim is for them to have fun and enjoy the gift, I would recommend this set. Again, some of the tricks are quite obvious whilst others are more fooling. 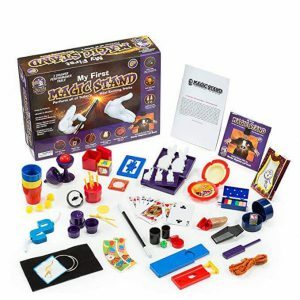 Overall, a very fun kit that whilst not being quite as much of a ‘fooler’ provides you with more magic! This is definitely the most ‘serious’ magic kit of the lot. Although the tricks are still easy to do, there is a definite step up in level from the previous sets in regards to how ‘fooling’ the magic is. In fact, the chances are that the tricks included in this set will fool the heck out of everyone (including you) if done right! What you SHOULDN’T expect: lots of fun props that are easy to do and easy to figure out. What you SHOULD expect: A selection of quality tricks that are aimed at beginners who really want to take their magic to the next level. That’s why I recommend buying this set for older children. In this set, you get 7 physical props. 1. A Levitation System; with this prop you’ll be able to make a card or even dollar bill float in the air. This is a really cool looking trick that, if done right, can blow people away. 2: Magic Card Box: change one card into another or even make them disappear in this simple box. In my opinion, this is the weakest trick of this set, but still a decent piece of kit. 3: The Three Rope Mystery. Rope magic is a really fun side of magic that surprisingly few magicians venture into. You shouldn’t underestimate how cool this trick is! 4: Sponge balls: an awesome set of sponge balls are a great addition to this set. 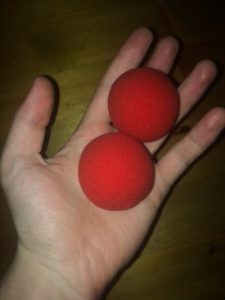 I recently wrote a tutorial on a magic sponge ball trick that you can learn in advance to get a feel for what is possible with these props. Click on ‘magic tutorials’ on the top menu to get started! 5: Vanishing device. This is another prop that professional magicians use on a daily basis (not an exaggeration). It looks too simple to work at first glance, but it has been a part of every professional’s kit for decades for good reason. A common use of this device is making a handkerchief disappear from inside your hand! 6: Pen through Dollar. You learn how to push a pen through the middle of a dollar, and then remove it with the dollar intact. Great for tricking schoolmates! 7: A Svengali Deck. This is a trick deck of cards that enables you to pull of apparent miracles with a deck of cards! These decks can cost you ten bucks alone, but are thrown in with the kit. Great value! PLUS: an instructional booklet that teaches 350 different tricks you can do using the above props. As I mentioned before, younger children will care generally care more about the AMOUNT of magic they get rather than the quality, but as your child gets older they may become bored with the easy and often obvious tricks from the previous sets. So, as I mentioned, if you’re buying for a younger child (say, under 10) go for one of the previous two kits. But if you want to get a slightly older child who wants to learn some REAL magic, this is the kit for you. Jim Stott seems like a super nice guy! As you can tell, this is definitely my No.1 pick of the bunch, but if it isn’t for you that’s fine too! You can read my full review of it here. All of the above selections contain more than enough magic to get your child started on an awesome hobby. You really can’t go wrong with these. 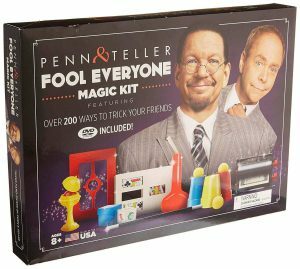 The Penn and Teller Fool Everyone Magic Kit for kids who are in between the two above categories (8-10) and want some a mix of ‘fooling’ and fun magic! Do you agree? Have you got any stories you want to share about your first magic kits? Please do let me know by leaving a comment in the comment section below. If you have any other questions, feedback or general comments please do go ahead and leave them too! If you found this post useful, don’t forget to share it (using the icons on the left) to other people who might also be wondering what the best magic kits for 10 year olds are! I agree that magic is great for kids to get into. My little brother liked doing magic and he is getting pretty good at it. Just seeing the excitement on his face when he pulls it off is enough for me. You’re exactly right! Thanks for the comment. This is an awesome kit idea for Christmas gift for my son! He loves magic and I can see his face glow in happiness when he unwrap this! Thanks for the information. Magic kits make great Christmas presents! Let me know how it goes or if you have any further questions. I love watching magic. While I have not been to a live show, I find it fascinating to watch on T.V. and I watch the show with Penn and Teller quite often. It’s funny as the tricks are being performed, how much I get sucked into really trying to find out how they make the magic happen. I truly believe it is a great hobby for children. I have heard several times just how much it has helped shy children come out of their shell. I think that is fabulous. Thank you for this great review. It’s been extremely enlightening. Keep up the great work with your site. Penn and Teller Fool Us is one of my favorite shows too! I have been lucky to go to a few live shows and I can assure you that it is even better in person. Thanks for the comment! Fool Us is one of my favorite shows! It is a great gift for kids of any age. Thanks! I always love little kids asking me if they can show me a trick. It’s just fun to watch them go to work and interact with you. My younger brother got into magic when he was a young age (maybe 12) and it just made me laugh (in a good way). And the smile on their face when they do a trick and you can’t figure out how they did it is priceless. Great article. Thanks for the comment! That’s exactly right. Thanks for the comment. Yes, absolutely! These are ideal gifts for the upcoming Christmas season too. Wow I never know that practicing magic for kids can be a good development for them! Thank you for point the benefits out I will get one for my nephew, he really need to boost up his confident and he definitely needs to improve his communication skills, that might apply to me as well but it’s ok I’ll have my nephew teaches me lol. I think I’m gonna get the Jumbo magic tricks set for him seems versatile and will keep him occupied for awhile. Thank you for solving my Christmas list! You’re welcome! That’s exactly why I created this post. Thanks for commenting. This sounds like the perfect way for any child to be occupied for hours learning to do the magic tricks with each of the kits. My question is you rated all three fairly easy to learn but which would be the best for an 8 year old who is rather old for his age? 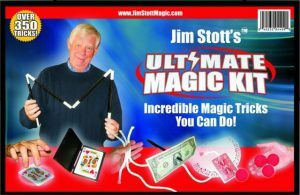 My grandson spends so much time with adults I would love to get him one of these kits for Christmas (he loves magic) but do not want anything to simple for him. He does get bored easily with new things I thought this might last holding his interest longer if there are plenty of magic tricks he can learn and use. Thanks for the idea of magic kits I can take my grandson off the shopping list now! That’s a great question Susan. You sound like you’re looking for a magic kit with lots of tricks, but also more challenging ones. In that case, I would recommend the Jim Stott set. There isn’t as many physical props, but the tricks are much more advanced and interesting, and there are a whole bunch of tricks that you’ll be able to do with them. I think it’s a great thing for kids being interested in magic tricks these days. I really like the fact that you listed the different magic kits that’s available to kids to try out and impress their friends as well as parents and other adults. Your number 1 pick, “Jim Stott’s Ultimate Magic Kit” looks absolutely amazing and I like the fact that there doesn’t appear to as many props as some of the other ones you’ve listed. Do you have kids that have tried them out or know anyone that’s really enjoyed some of these magic kits? The reason I know the Jim Stott kit is so good is because I’ve personally used many of the props involved and can assure you that they are great! Thanks for the comment. I think I’ve just found the Christmas presents for my nephew (7) and my niece (10)! They would love these sets! What a great hobby and the skill to master. And at such young age too. Magic is such fun! When my children are a bit older, we are going to learn magic tricks together! Thanks for the comment! Magic kits make for great Christmas presents, absolutely. That’s a great point; lots of very useful skills for later down the line! Thanks. I am a little bit new to magic but for the few times I’ve watched guys performing it, it looks cool and very entertaining. I think this is one of the best gifts I would buy for my 10 year old son on Christmas. I think magic would boost my sons memory and self esteem even in other areas of life. I’m glad to realize that every kit comes with it’s own instructions on how to use and operate. Many thanks for such a timely post. That’s exactly the aim Paul! I’m glad you enjoyed. Feel free to let me know if you have any other questions. Thanks for sharing this magic review article for kids! After reading your article, I found some new way of developing and building my kids’ confidence level. 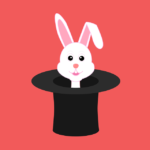 What I also found out that magic can become a hoppy for my kids and it help him to develop another kind of skillset. It’s also one way to divert his attention from computer games. Great point Glenda! That’s a good idea. It’s definitely a great skill to have, you never know where it might come in useful.